Should you keep skincare and makeup in the bathroom? 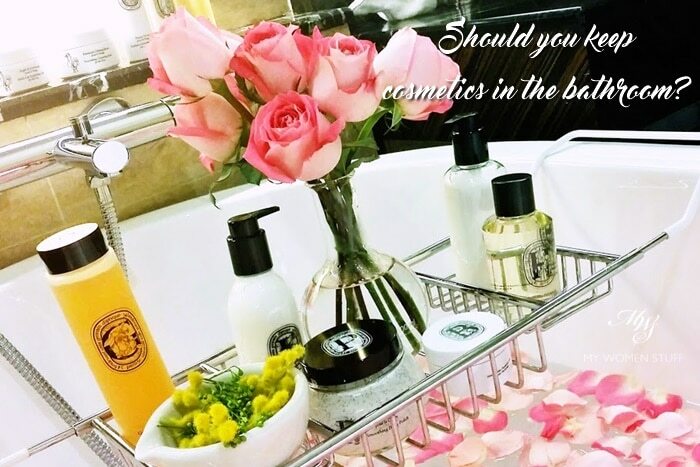 Home » Interesting Discussions » Your Say: Do you keep your skincare and makeup products in your bathroom? Should you? Your Say: Do you keep your skincare and makeup products in your bathroom? Should you? When I was a kid, I used to creep into my parents’ room in the morning, to watch my Mom get ready for work. It wasn’t an elaborate process, as she hardly wore makeup except for powder, blush and lipstick, but she would, in the morning and evening, spend a little time at her dressing table. So, I grew up with the notion that a dressing table, or a vanity table was something everyone had, as a place to put their skincare and makeup. I later found out that I wasn’t quite on the mark, because I saw that a lot of people actually talked about keeping their cosmetics – skincare and makeup – in the bathroom. I remember coming across a tip in a magazine once, many years ago, that suggested that skincare, in particular, be kept in the bathroom, so it was within easy reach for use after a shower, or washing your face in the morning and evening. I also recently came across some pictures on Instagram, of people showing off their bathroom shelves filled with their skincare and back-up skincare, and some, with makeup. So, naturally I got to wondering. Do you keep your skincare and makeup in your bathroom? Should you do that? Well, I’m going to put it out there and say that no, you should not be putting your skincare and makeup in the bathroom. If you do, I’d highly recommend that you remove it at your soonest opportunity, and if you really care about the stuff you put on your face, to find some space in your bedroom for them. If you didn’t already realise, bathrooms are very humid places. This is true in every country of the world. Where it’s cold, that’s where you go for your hot, steamy showers, that fill the room, and everything in it, with a fine mist. If you live where it’s hot like I do, the air is already humid as it is, and showering always adds water vapour into the air. Lovely. Now, imagine what that’s doing to your skincare and makeup sitting by the sink or in the damp, dank bathroom cabinets *shudder* It will not react immediately, but heat and humidity from your regular showers (I sure hope they are regular! 😛 ) will cause your cosmetics to degrade more quickly, and for bacteria or microbes to grow and multiply more quickly. If you’re going to spend all that money on good quality skincare, the last thing you want, is for them to turn on you. Ditto makeup. If you’ve never seen an eyeshadow palette go mouldy, try keeping it in a damp environment for a while and see what happens. Also, bathrooms tend to be quite bright places, and light isn’t always good for cosmetics either. As clean as you keep your bathroom, it isn’t the cleanest room in your house. It can’t be. You go in there to wash away dirt in the bath or shower, and if it’s an en-suite with a toilet (and most are), I think it’s self-explanatory. It’s a known fact that just the mere act of flushing with the toilet lid up can release millions of bacteria into the air. Now, imagine that your skincare and makeup are in that room. Not a pretty thought, yes? Ok, so you’ve removed your skincare and makeup from your bathroom. Where should you store them? Logically, a cool, dry place away from the light is ideal. Light and heat can interfere with many ingredients in skincare e.g. retinol or vitamin C products, and cause them to lose their efficacy. You don’t want to spend hundreds of dollars on your cream, only to find it does not work, do you? When I set up my vanity, I pick a place as far away from the window as possible. While I realise that it’s counter-productive to doing makeup in natural light, I’d much rather ensure that my products are kept at their optimum efficacy for longer. If I really wanted more light, I can use a lighted mirror or, simply move myself closer to the window. Not all of us have the luxury of having large and elaborate vanity tables or dressing rooms. Space is a luxury in most modern homes, especially if you live in an apartment or in the city. Vanity tables can take up a lot of space, and if I’m to be honest, not boast of that much space to place your lotions, potions, powders and creams. So, I use a chest of drawers. I have learned from experience that I prefer to stand to do my skincare routine and makeup, instead of sitting down, so the lack of a chair suits me fine. My chest of drawers is about chest-level, which puts my skincare and makeup at eye-level. Because of what it is, it gives me space in the drawers in which to keep my products, away from heat and light. For me, this works. If floor space is at a premium, see if you can keep your cosmetics in a shelf in your closet. Doable, if you don’t have 300 blushes (ahem! 😛 ) but otherwise, could pose a challenge. Otherwise, if you don’t have 300 blushes, consider a cosmetics box, maybe, that you can store in a cupboard, and take out when you need it. Your daily skincare could go in a basket or tray that you keep on your bedside table (if its not exposed to bright light and heat). Personally, the only products I keep in the bathroom are my face washes, shampoo and body washes. I don’t even keep body oils and body creams or lotions in there for the same reason I won’t keep my skincare in there – I don’t want them turning bad. Because I use face and body washes and shampoo everyday, they eventually run out quite quickly, and I think the PH level is unfriendly enough to the growth of bacteria. The only time I think keeping skincare in the bathroom might be a little more OK, would be if you have a very large, cool bathroom, with your shower and toilet tucked away at one end, and your vanity at the other end with little sunlight, and some dehumidifying contraption that keeps the air in the bathroom dry. So tell me: Do you store your skincare and makeup in your bathroom? If you don’t, where do you keep them? BATHROOM! I don’t have a backlog of skincare so whatever I use, it’s there on the shelf in the bathroom. I either have the heater going (which dries every damn thing in sight) or the fan going when I shower. Once I’m done, I fling the windows and door opened and apply my skincare in my robe. As for makeup, I have the bare minimal that I use quickly in the mornings. It’s just easier during the morning rush. THe bulk of my makeup is stored away in the bedroom. I do keep the curtains opened, though. I get only the morning sun and there’s a nice tree shading my bedroom so it’s not hot enough to damage anything. Also, toilet and bathroom are separate. And like LeGeeque says – shut the lid before you flush!!! BUT my makeup is in my bedroom. I think we all need bigger rooms… now, there’s a thought! I keep toner in the bathroom for convenience sake because that’s the first thing I use after washing my face. Otherwise I’ll just forget! I bring only my cleanser to the bathroom. I don’t want my powders and compacts to degrade due to humidity and changing temperature. Yes, size absolutely matters in this case, hence my caveat on those with luxury of space 🙂 For those who do, it would be much more convenient, I agree. But for those of us with smaller bathrooms, I think keeping these things out of there would be the best bet. I used to watch my grandma applying body lotions and face powder in the living room cos space was a contraint for the elderly back then. Hehehe! Like you, I only keep my cleansers, shampoos and body washes in the bathroom for the same reasons you have stated. The simple reason was becoz love my skincare to be cooler, so they are placed at my bedroom, under the aircond. Oh, if the aircond ever leaks and causes flood, I will cry. BATHROOM! For my skincare.. I don’t really think the limited exposure to humidity would spoil it? My logic is they’re only open when I use it. And if I don’t apply them after I shower I’m usually going to forget to use them! Oops. But my makeup resides on my study table in the study room. No vanity table for this missus! The land in Singapore is very expensive I’m afraid.. Not much room for a separate vanity. Haha Well, my argument is against keeping it in the bathroom so I’m really biased 😛 But I can understand the economies of space. That said, I never liked having too many things in my bathroom coz of how humid it can get in there, and how hot (it faces the sun) so it’s probably a good thing I don’t keep any of my stuff in there! I never used to keep skincare in the bathroom until I moved to Hong Kong, where houses are tiny! My bathroom is relatively big and there’s a built in cupboard with many shelves so it makes sense for me to keep my skincare there. The cupboard has a door that I always keep shut and I also put in a desiccant moisture absorber (like thirsty hippo). I also have a dehumidifier running 24/7 in my house and I make sure my exhaust fan is turned on after showering to get rid of the moist air. So I’m not too worried about the humidity issue but I don’t keep makeup or any of my backup skincare products in that cupboard. Ah you have the one thing I don’t have – a floor length mirror! I keep telling myself I should get one, but I don’t have space for it so I kept putting it off. But it’s useful to have isn’t it? I don’t mind both. I don’t have the luxury of having a bathroom in my bedroom so I have my things in my room by default. Only cleansers and toothbrushes in the bathroom. When I’m at a hotel, I do put all my stuff in the bathroom (when there’s a luxurious sink). Just cleanser in the bathoom, everything else in the bedroom… I just move things between bathroom and bedroom when I need to use them. Apart from the showering, body scrub, hair cleaning, deodorant, body powder, I have only my facial cleansers, scrubs, make up remover & wash-off masks in the bathroom. The rest are in the bedroom, on a table/ vanity tower next to my stand mirror. I am with you in terms of hygiene n humid condition of the bathroom not really a suitable place for ur delicate products. Plus the more products u have in the bathroom the more cluttered it gets, the dirtier everything is. Absolutely with you on the less is more thing for bathrooms! I often go overboard with shower stuff in the shower stall and sometimes, that can result in everything being a little icky after a while. Bathroom – everything’s within reach post shower. And to address the issue on humidity, I have a small fan to keep air circulated. Also, I have been blessed w a pretty big bathroom (total area approx 30 sqm including my dressing room) ?